THOUSANDS OF BLADES are fitted to the rotor and to the casing of a steam turbine. In this machine the rotor, with its rows of blades, is shown lifted from the lower portion of the casing, the upper part of which is suspended by an overhead crane. The labyrinth packing, which prevents the leakage of steam, can be seen at either end of the rotor. 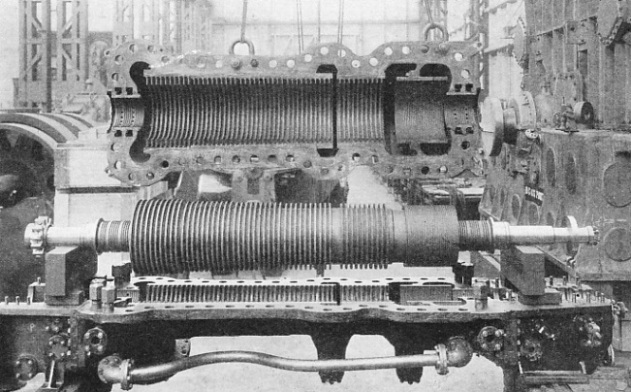 On the left of the shaft is the coupling that transmits the drive, and at the right end of the shaft is the thrust collar. THE smooth-cased turbine conveys to the uninitiated but little of its hidden might. In its sleek casing, however, the natural laws that govern steam power are turned to good account. Volume, pressure, velocity - all are interwoven to serve one of the most wonderful machines ever devised by man. In the chapter beginning on page 787 was traced the story of the turbine over a period of nearly two thousand years. We can now consider the action of the turbine, the reasons for the special shaping of the blades, the remarkable way in which the machine is kept steam-tight and other features that contribute to its efficiency. Two distinct types of turbine were referred to in the earlier chapter. One was the “reaction” turbine invented by Hero of Alexandria about AD 50. The other type of turbine, suggested by Giovanni Branca in 1629, is known as the “impulse” type. It is important to distinguish between these two turbines because some modern machines are built on the reaction principle, and others are built to work as impulse turbines. Sometimes the two principles are adopted in one machine. A firework, the well-known catherine-wheel, provides a good illustration of reaction. This wheel, whirling round at a furious pace, with its showers of brilliant flames and sparks, is really a reaction gas turbine in miniature. The end of the coiled paper tube, with its rush of lighted powder, is forced backwards by reaction and the catherine-wheel continues to revolve on its pin until the supply of explosive “fuel” is exhausted. It is on this principle of reaction that most modem turbines depend for their operation, coupled, however, with the impulse action suggested by Giovanni Branca in 1629. T he first practical turbine was built at Gateshead, Co. Durham, in 1884. An early turbine of the impulse type was designed by Dr. C. Gustav P. de Laval in 1889. The impulse turbine depends for its action on the behaviour of steam (under pressure) that is allowed to expand. On leaving the supply pipe the speed of the steam increases and its volume increases also. At the same time the pressure falls. In the form of expansion aimed at and known technically as “adiabatic” expansion, no heat passes through the walls of the steam pipe. To permit the required expansion of the steam, without change of temperature, special nozzles are used. steam “blast”, but, after the initial rush, the volume increases faster than the speed of the steam. Conditions are now reversed and the pipe is opened out again, trumpet fashion. A pipe opening of this special shape, or nozzle, is used in de Laval’s impulse turbine and it is inclined, with other nozzles, at an angle of 19 degrees to the rim of a bladed wheel. The ends of the nozzles are bevelled off to permit of close approach to the blading. The blades are bucket-shaped in section and in general appearance resemble a woodworker’s gouge. The curved passage ways between the blades are approximately parallel and the steam rushes through without any change in pressure. The pressure change takes place only in the nozzles. The speed of the steam does, however, undergo a change in relation to the wheel. The steam enters the blades at great speed and loaves them slowly compared with the speed o! the wheel. It is this difference between the speed of entry and the speed of leaving that accounts for the work done in turning the wheel. Technically described, the kinetic energy of the steam is communicated to the turbine rotor. In a de Laval impulse turbine the speed of the blades, about 30,000 revolutions a minute, must be nearly half that of the steam to achieve maximum efficiency. Such a speed, however, renders the single-wheel impulse turbine unsuitable for marine propulsion and various means are adopted to use the velocity of the steam, so that it is “spread over” a number of bladed wheels revolving at a moderate pace. This arrangement of the turbine, with every wheel using part of the steam’s energy, is known as “velocity compounding”. A second method of rendering the impulse turbine more efficient, especially for marine purposes, is the use of “pressure compounding”, as in the Rateau type of turbine. Where pressure compounding is adopted, the rings of fixed blades are omitted, and for them are substituted sets of nozzles which provide a drop in pressure with an increase of velocity. The type of turbine that is more widely used than any other, especially for marine work, is the reaction turbine developed by the late Sir Charles Parsons. It was the invention of specially-shaped reaction blading by Sir Charles Parsons that enabled this principle to be applied to the working of the steam turbine. The Parsons machine, however, is not a purely reaction turbine as was that invented by Hero some nineteen centuries ago. In the Parsons turbine, although it is described as being of the reaction type, the steam has an impulse action on the blading in addition to its use on the reaction principle. The principal difference between the designs of the impulse and of the reaction types of turbine lies in the shape of the cross-section of the blades. In the impulse turbine the blade-section is crescent-shaped and the space between adjacent blades is symmetrical about its centre. Impulse blades merely change the direction of the steam after having absorbed its kinetic energy. Reaction blading, however, differs from that used for impulse turbines in the shape of the section as well as in its arrangement on the rotor. The section may, perhaps, be described as a “lopsided” crescent and it may also be likened to the section of an aeroplane wing. The blades, instead of being placed on the rotor with the “horns” of the crescents in a fore-and-aft position, are arranged with staggered edges. The fixed and the moving blades are arranged in this manner, but they face in opposite directions to effect reversal of the flow of steam. The shape and angle of the blades - for example, those of the first row of fixed blades - provide a series of openings that decrease in size in the direction of the steam’s flow. Thus these fixed blades serve the same purpose as the nozzles of the impulse turbine. 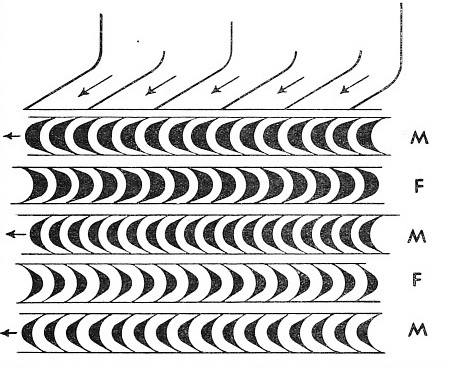 BLADES OF A VELOCITY COMPOUNDED TURBINE are arranged as shown diagrammatically. Steam enters the machine through the nozzles shown at the top in the direction of the oblique arrows, and impinges on the first row of moving blades (M) that move in the direction indicated by the horizontal arrows. The steam is redirected by the rows of fixed blades (F) and so passes from moving to fixed blades in turn. Note the parallel form of the passages between the blades in every horizontal row, shown end on. The steam accordingly passes through the first ring of fixed blades or nozzles and, with an increase of velocity and decrease of pressure, imparts an impulse to the first ring of moving blades. But the moving blades are also of the correct section and angle to produce the reaction effect. The spaces between adjacent moving blades may be regarded as steam-guns. Because the steam issues from them much faster than it enters, the blades are given a “kick” or reaction-push. This action is continuous and the pressure drops steadily as the steam rushes through row after row of fixed and moving blades to its final destination - the condenser. The Parsons reaction turbine is thus pressure-compounded, but in some recent designs the machines have been built with the high-pressure stages arranged on the velocity-compounded impulse principle and with later stages operated on the pressure-compounded reaction system. Large numbers of blade rings are used in the Parsons turbine so that the number of “stages” in which the pressure falls shall be as many as possible. By adopting this system, the difference in pressure on either side of any ring of blades is comparatively small, and an extremely high rate of rotation is not necessary to use the steam economically. In the de Laval impulse turbine the whole of the steam’s energy is expended on one row of blades, that is, in a single stage, and the speed of the rotor is consequently tremendously high. Another outstanding feature of the Parsons turbine is the increase in size of the blades. Those at the low-pressure or exhaust end of the machine are much larger than those at the high-pressure end, into which steam is admitted from the boilers. This increase in size may be compared with the successively larger cylinders of triple- and quadruple-expansion reciprocating engines described in the chapter beginning on page 719. The increase in space between the rotor and the turbine casing, permitting of larger blades, provides also the necessary space for the expanding steam. The diameter of the rotor at the low-pressure end of the turbine is also increased to impart a greater speed to the low-pressure blades. In ideal conditions the increases in size would be carried out gradually from one end of the turbine to the other; but, for convenience in construction, this is done in suitable steps or stages. For further convenience, the modern Parsons turbine is usually arranged in three separate “cylinders” or casings - for high, intermediate and low pressures respectively. Sometimes four turbine “cylinders” are used to secure the necessary drop in pressure. THE DE LAVAL NOZZLE is shown in detail in the top diagram. Steam passes, as indicated by the arrow, through a narrowing orifice and then through a trumpet-shaped opening. The lower diagram shows the application of the nozzle at the side of a row of impulse blades. The use of more than one turbine cylinder, which contains thousands of blades, may be compared with the expansive working of steam in the multiple cylinders of a marine reciprocating engine. The turbine, however, has many advantages over the reciprocating engine in its use of the steam. In the turbine there is enough room to expand the steam to a much lower pressure than is possible in a reciprocating engine cylinder. In addition, there is no alternate heating and cooling of the casing. The heat is conserved by lagging the casing with a covering of insulating material. A further advantage in the turbine is the use of large exhaust passages which are always open to the condenser. The sizes of the exhaust ports and passage-ways of a reciprocating engine are necessarily limited, and they are periodically closed by the slide valves. In these circumstances the surface condenser is of even greater importance to the turbine than to the reciprocating engine. The condenser enables useful work to be abstracted from the low-pressure steam by the provision of a vacuum, which thus causes a further drop in pressure. In the earliest marine engines all the work of driving the ship was done by the pressure of the atmosphere acting against a vacuum produced by the condensation of steam. There is a big gap between those pioneer engines and modern turbines that are supplied with steam at a pressure of 400 lb per square inch, but the importance of the vacuum in the condenser still remains. Figures quoted by Professor E. N. da C. Andrade illustrate this point. He states that almost the same power can be obtained from steam at 200 lb expanded to ½-lb (29 in of vacuum) as from steam at 400 lb expanded to 1 lb (28 in of vacuum). 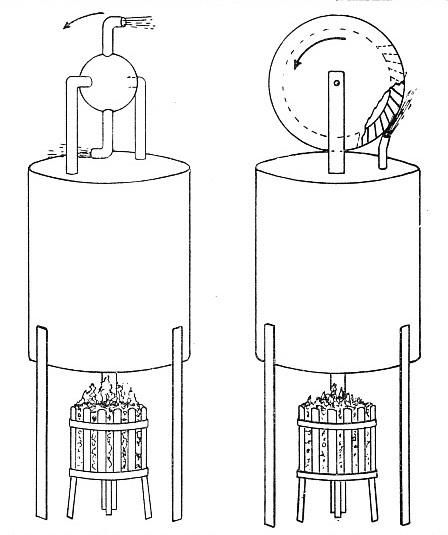 These figures show differences of only one inch of vacuum, or ½-lb in pressure, at the condenser end of the turbine, but of 200 lb per square inch at the high-pressure end. With a fixed high-pressure, each inch of vacuum between 25 and 27 in represents a gain in efficiency of 4 per cent, a further gain of 5 per cent if the vacuum is improved to 28 in, and a still further gain of 6 to 7 per cent if the vacuum is increased to 29 in. The Parsons turbine is fitted with a device called a vacuum augmenter to improve the vacuum. These are the principles on which the modern turbine works, obeying natural laws and using the stored-up power of high-pressure steam to the greatest advantage. The marine turbine, however, has many mechanical features that are of special interest. The blades are made of the finest quality stainless steel, as they have to withstand tremendous heat combined with mechanical stresses due not only to pressure, but to the centrifugal forces to which they are subjected when whirled round at high speed. Centrifugal force may be demonstrated simply by the dropping of a match on a revolving gramophone disk. Immediately it touches the revolving surface the match flies off sideways. To prevent the turbine rotor blades from moving outwards similarly and jamming in the casing, an ingenious method is adopted to fix them. In the rotor are cut a number of circular grooves of Ц-section, and in the side walls of the Цs are cut several V-shaped grooves. The blades are each made in one piece, with a rectangular “root” in which are milled V-shaped grooves that correspond with the V-grooves in the rotor. When building up the complete rotor the blades are placed sideways in the Ц-grooves, and are then given a twist to secure them in position with the V-grooves interlocked. The last one or two blades in the ring are of special design to effect the final locking up of the completed blade ring. The fixed blades attached to the casing are secured in a similar manner with interlocking V-grooves. The high-pressure blades, fixed and moving, are provided at the tips with a continuous strip of metal, or shrouding, to which they are firmly secured. This system of end-tightening, as it is called, prevents leakage of steam past the blade tips, and is adopted because it is impossible to provide sufficiently small clearances between the fixed and moving parts of the turbine. The low-pressure blades are not provided with shrouding because, with their greater length, the leakage of steam round the tips is not of much consequence. The clearance between blade shrouding and casing and rotor respectively is usually about ¼-in. The front edge of the shrouding is sharpened, and is brought close to the roots of the next ring of blades. This axial clearance, as it is known, is made adjustable by a micrometer collar on the end of the turbine shaft. The collar enables the whole rotor to be moved as required in a fore-and-aft direction by distances that are measured in thousandths of an inch. END-TIGHTENED BLADES are clearly shown in this illustration. Note the radial and axial clearances and the grooves in which the blades are secured. The end-tightening strips or rings that cover the ends of the fixed and moving blades are shown with their sharpened edges. The purpose of the sharp edge to the shrouding is twofold. It causes turbulence in any steam flowing round it and so serves as a baffle. Should the sharp edge accidentally touch an adjacent stationary surface, it is merely ground away harmlessly instead of jamming or causing friction by rubbing. 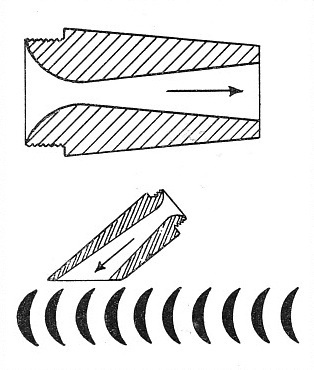 Similar knife-edges are provided in the Parsons turbine to prevent leakage of steam out through the shaft bearings at the high-pressure end, or incursion of air at the low-pressure end. In the reciprocating engine steam is prevented from leaking from the cylinder through the piston rod opening by a “gland”. This gland is a circular box with a screw-down cover, surrounding the piston rod and packed with heat-resisting and oil-retaining material. 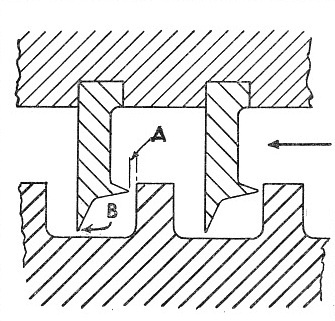 Such a form of gland is impossible for the turbine shaft revolving at high speed, and a type known as a labyrinth gland is used, with knife edges similar to those on the shrouding, referred to above. The labyrinth gland comprises a series of plain grooves in the rotor shaft. Rings project from the turbine casing into the rotor grooves and the interior of every ring is sharpened to a knife-edge. The rings are also provided with circular knife-edges standing out at right angles from the ring sides that face the flow of steam. 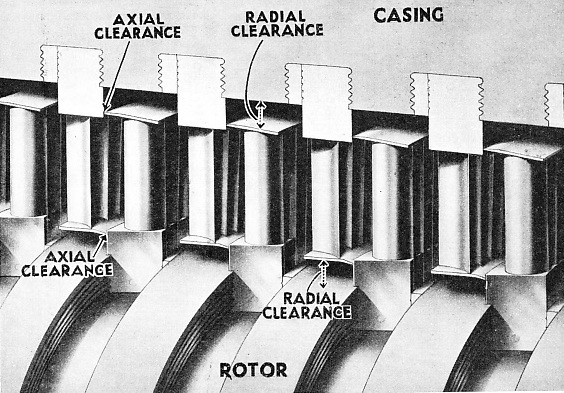 The clearances of the radial knife-edges facing the bottom of the rotor grooves are not adjustable, but the axial clearances of the edges adjacent to the sides of the Ц-shaped rotor grooves are adjusted by the same micrometer collar that determines the clearance of the shrouding. Little steam leaks past the knife-edges of the labyrinth, whose action is assisted by the shaft in carrying the steam round with it. There is therefore no contact between the moving and fixed portions except at the bearings. In a turbine the bearings are exceptionally well fitted and are supplied with oil under pressure. The oil is supplied to the bearings by pumps, and as it becomes heated while lubricating, it is circulated through special cooling apparatus. The bearings are the only portions of a turbine that require oil, in striking contrast with the reciprocating engine, whether steam or diesel, on which all moving surfaces in contact must be lubricated. This clearly demonstrates why it is possible to use steam in a turbine at a pressure of 400 or even 550 lb superheated to a temperature of 750 degrees Fahrenheit. There is no oil in the turbine for this tremendous blast of hot gas to carbonize. LABYRINTH PACKING to seal the turbine against the atmosphere is indicated here in section. At the top is part of the casing with protruding rings, having sharpened edges that revolve in grooves in the rotor. The adjustable axial clearance is indicated at A and the radial clearance at B. The direction of the steam flow in the turbine is shown by the arrow on the right. Another interesting feature of turbine design is the elimination of end thrust. With steam rushing violently through the casing from one end to the other, the rotor is not only rotated; it would be pushed bodily forward as well if means were not adopted to prevent this. In a set of turbine engines, the casings - high-, intermediate- and low-pressure - contain rotors that are bladed in groups. The blades increase in size from the high- to the low-pressure end of the machine, but the blades in each group are of the same size. To counteract the end thrust, the shaft in each casing is provided with a number of “dummy pistons” or unbladed disks. The end pressure on the blades is neutralized by the end pressure (in the opposite direction) on the dummy pistons. Dummy pistons are not always required, however. In some turbines steam is admitted at the centre of the casing and flows to either end simultaneously, so eliminating end thrust. The blading of such turbines is arranged at either end to face the central steam supply. Another method of overcoming end thrust is to use a Michell thrust bearing on the shaft. The Michell bearing was patented by A. G. M. Michell in the years 1905-12. It depends for its action on the tilting action of metal pads that comprise its working surfaces. The pads are arranged in a casing, radially for a thrust bearing, axially for a shaft bearing, and their construction enables them to tilt under the action of a revolving collar or shaft. REACTION BLADING is illustrated by this diagram. The moving blades (M) revolve in the direction shown by the dotted arrows. 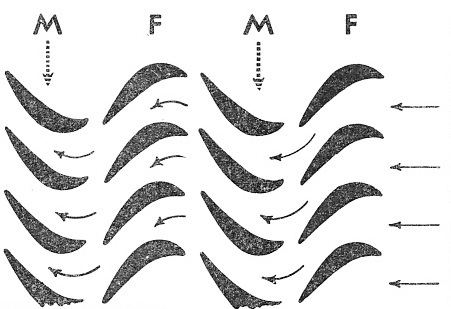 The passage of steam through moving and fixed blades (F) is indicated by the horizontal arrows. The blades are in section, and their shape and the nozzle-form passages between them are shown. This action has the effect of drawing a wedge-shaped film of oil between the moving surfaces. The bearing faces are therefore constantly lubricated under all loads. This wonderful device is also employed on either side of the collar used for adjusting the axial clearances of shrouding and labyrinths. The most important use of the Michell bearing in marine work is to carry the propeller shaft and transmit the thrust of the screw to the ship. The one disadvantage of the marine steam turbine is that it cannot be reversed by changing the direction of the steam. This is overcome, however, by the use of a group of blading arranged for astern working which is attached to the rotor of one or more of the turbines comprising the “set”.